Clinical Case Of Sinus Graft Procedure. A new series of short blog articles relating to cases of dental implant treatment carried out at our clinic Brighton Implant Clinic. A patient presented at our clinic complaining of missing and damaged teeth. The patient had missing upper teeth and a bridge replacing some lost teeth for many years. On presentation at our clinic in Hove we noted that the upper bridge was loose and the patient was very concerned that the bridge was about to fall out. The patient was medically fit and healthy, non smoker and not taking any medications.A panoramic radiograph and CT scan was taken to ascertain the degree of damage and the amount of bone present in the upper and lower jaws. The patient was most concerned about getting a solution for the upper jaw as this was most visible and the loose bridge was about to fall out. 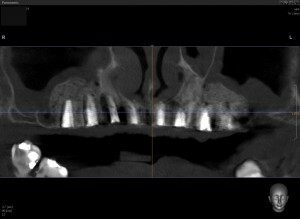 Upon looking at the CT scan it was noted that there was very limited amounts of bone present for dental implant treatment. It was agreed that the best solution was to first remove the problem teeth and allow the gums and bone to heal before placing implants. The extraction of the damaged teeth was done in stages in order to preserve as much bone as possible. Eventually all of the teeth were removed and the gums and bone left to heal for 3 months. During this time the patient had to use a Removable Denture. Whilst this is a difficult stage of treatment it is a very important part of the treatment. In some cases patients may have an abundance of bone and this will make dental implant treatment much easier for the surgeon. In patients with more bone it is possible to carry out implant treatment in just one day however in this case there was so limited amounts of bone that it was decided to preserve as much bone as possible. During the healing phase, the gum tissues healed completely and some bone grew into the areas where the teeth were removed. After three months a further CT scan was taken in order to assess the amount of bone the patient had and plan for dental implant treatment. The options of treatment were explained to the patient. 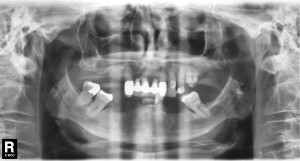 In this case a standard teeth on four procedure would have meant that all of the implants would be only in the front of the mouth as this is where the patient had bone. We gave the patient options for zygomatic implants or sinus lift procedures. Zygomatic implants are different from conventional dental implants in that they are placed outside of the mouth. 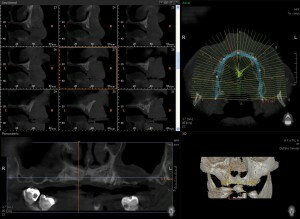 Essentially the implants are placed into the zygomatic bone ( cheek bone ) and together with conventional implants will provide support for a full arch implant supported bridge. Zygomatic implants are longer than conventional implants and the surgery required to place them is more complex than standard dental implant surgery. An alternative to zygomatic implants is sinus augmentation or sinus lift procedure. A sinus lift procedure is less invasive than zygomatic dental implants and if successful can provide an excellent solution for increasing the amount of bone for dental implant placement. In this case we were able to graft both of the maxillary sinuses and simultaneously placed 8 implants in the upper jaw. The patient continued to use the removable denture while the implants heal. 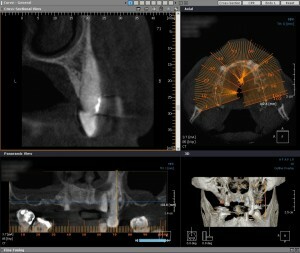 Due to the additional bone placed into the sinuses we will wait 9 months for the bone and implants to heal before uncovering the implants and making a full arch fixed dental bridge on the implants. Dental implant treatment can take months to complete from start to finish, it is important that patients realise that this is a long process however the results are usually life long. Dental implant treatment is highly successful with success rates as high as 98%. What types of bone are used in sinus grafts? Dr Bruno Silva is a dental surgeon working exclusively with dental implants. The Brighton Implant Clinic is a group of three clinics based in Brighton, Hove and Hailsham.